The ancient Greeks thought - poetically, but incorrectly - that these statues represented Memnon, the mythological son of Eos (dawn). It is said that the northern (right) statue made a sort of moaning sound at dawn and dusk, but fell silent after repairs by the Roman emperor Septimius Severus. 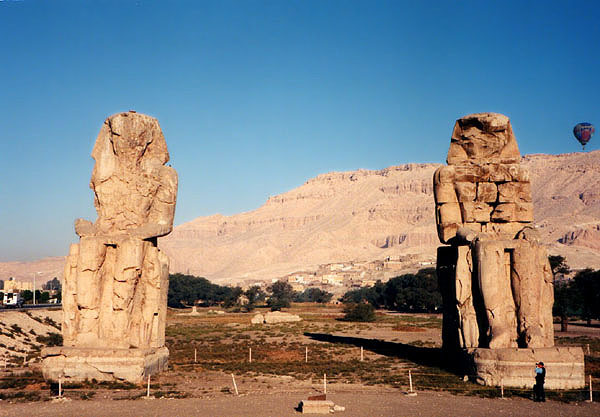 The colossi actually depict pharaoh Amenhotep III, and guarded his (now vanished) mortuary temple. They continue to impress, even in their ruined state. Their enormous scale - 1,000 tons each in weight, and 75' high - can be seen by comparison with the tiny figure of a visitor in the lower right of the photo. A modern hot-air balloon, hired out for tours, is visible above the cliffs to the right.